History: Curt Hennig, thoughout his professional wrestling career, was always highly respected as one of the best technical workers in the business. Hennig really began his wrestling career with the WWF in the late '70s, as a jobber. Then he went to the NWA Pacific Northwest, where he wrestled with other such greats as Rick Martel and "Rowdy" Rowdy Piper. In April 1982 he teamed up with his brother Larry to win the NWA Pacific-Northwest Tag-Team Titles. They lost the titles within a few weeks. Hennig then worked towards the Heavyweight Title, finally defeating Sheik Abdullah Ali Hassan in May of '83. He held the title for 4 months before losing to the Dynamite Kid. Hennig then went back to tag-team wrestling, joining up with Buddy Rose to win the Tag belts for the second time, defeating Rip Oliver and the Assasin in November '83. Again, however, his tag title reign was short. But he came back a month later with Pat McGhee and won the Tag Team Belts a third time. This time, they held the belts for a little more than a month before Rip and the Assassin regained them. Soon after, Hennig went to the AWA to hone his craft. For many years, Hennig toiled away in the AWA, eventually becoming one of the stars. In January 1986, he and Scott Hall won the AWA Tag-Team Titles from Jim Garvin and Steve Regal. They held the belts for about 5 months before losing to Buddy Rose and Doug Somers, then the two went back to singles wrestling. In May 1987, Hennig won the AWA World Title from Nick Bockwinkel, one of his greatest wins. He stayed the champion for more than a year before finally being dethroned by Jerry Lawler. Soon after, Hennig went back to the WWF, this time as "Mr. Perfect". Before his debut, several taped vignettes were broadcast, showing Mr. Perfect compete in many different sports. Mr. Pefect then made his long-awaited appearence in stunning fashion, destroying the WWF World Title that was around the waist of Hulk Hogan. Mr. Perfect would stay undefeated in the WWF for a long run, until losing to Hogan in a televised match. As The Perfect One, Hennig gradually built up his reputation as one of the more technical wrestlers in the game. With such managers as The Genius and Bobby "The Brain" Hennan, Hennig also had a lot of assistance. In April 1990, after the Ultimate Warrior had won the World Title, Mr. Perfect beat Tito Santana in the tournament final to become WWF Intercontinental Champion. He lost the belt to Kerry von Erich four months later, but came back to beat von Erich in a return match in November. Due to this, he was named "Best Wrestler" in 1990 by the RSP-W Pro-Wrestling Achievement Association. 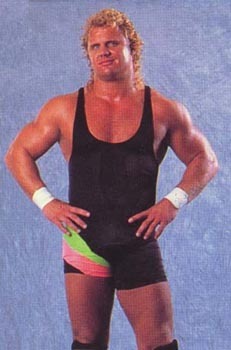 Hennig was the Intercontinental Champion for about 9 months before losing to Bret Hart. After this match, Hennig took a leave from the sport due to a back injury. He returned as Ric Flair's Executive Consultant for a while, staying ringside along with Heenan. This gave Hennig's back time to heal up. When Hennig was healthy again, he broke into a feud with Flair, eventually winning a "Loser Leaves WWF" match over him in 1993. Hennig went on to have feuds with Lex Luger, Shawn Michaels, Hart, Diesel, and others, before again leaving with back problems. He came back as a commentator for a while, then became the manager of Hunter Hearst Helmsley. But a personality conflict with WWF soon sent him to World Championship Wrestling. Hennig came into WCW wrestling under his real name, as the WWF owned the trademark on Mr. Perfect. Hennig first joined up with Diamond Dallas Page, teaming with him against Scott Hall and "Macho Man" Randy Savage at Bash At The Beach '97. The two would eventually feud with the other, with Hennig beating Page at Road Wild. Later on, Hennig moved into a top position, replacing the retiring Arn Anderson as the Enforcer of the IV Horsemen. But Hennig proved his true colors at Fall Brawl, as he turned on the IV Horsemen, joining instead with the new World order(nWo). The next week, he defeated Steve "Mongo" McMichael for the WCW United States title. Curt is usually thought of as the one who destroyed the Horsemen, as they soon disbanded. Hennig would hold the US Title for 4 months, until Diamond Dallas Page defeated him in December of 1997. Hennig kept wrestling for the nWo after losing the US Title. He briefly joined the nWo Wolfpac (when it was a face group) with his long-time friend Ravishing Rick Rude, but then both Rude and Hennig betrayed the Red 'n' Black to nWo Hollywood. Hennig, with Rude as his manager/friend, then had feuds with Hart, Bill Goldberg, Konnan, and others. 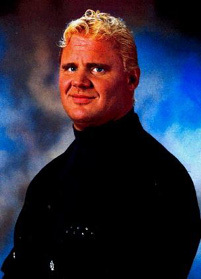 After a brief stint on the shelf with a knee injury, Hennig made his return at Starrcade '98, where he helped Eric Bischoff pull off the upset, defeating Ric Flair. He then teamed with Barry Windham against Ric and his son David Flair. The two lost the match, but Hennig and the rest of the nWo beat on the two wrestlers afterwards. 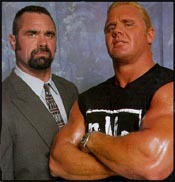 Hennig then became one of the "B" Team, being one of the Black 'n' White nWo members. 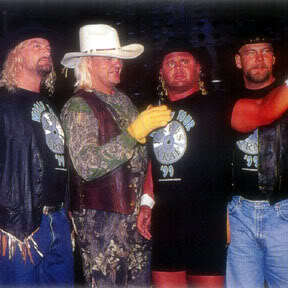 In February '99, the nWo turned on Hennig, beating him savagely and ejecting him from the group. Hennig vowed to get revenge in his own fashion, entering the tag-team tournament along with his partner Barry Windham. Hennig and Windham tore through the competition, not losing one match during the Double Elimination tournament. In the Finals at Superbrawl, Hennig and Windham defeated Chris Benoit & Dean Malenko, after losing the first fall, to earn the WCW Tag-Team Titles. They retained the titles for about a month before losing them to Benoit & Malenko in the Lumberjack rematch at Uncensored. Arn Anderson, and his tire iron, proved to be a big factor in that match. For the next month, Hennig and Windham were scarce, with both wrestlers having injuries. In May '99, Hennig returned on his own, wrestling in the singles division. He then began a feud with Konnan, claiming that country music was better than rap. The feud then brought in Bobby Duncum Jr, for Hennig, and Rey Mysterio Jr for Konnan. The two teams met at the Great American Bash, which had Windham reappearing to help out Hennig and Duncum. But, due to Master P and his bodyguards, Mysterio Jr and Konnan came out with the victory. This caused the feud to erupt, with the No-Limit Soldiers joining together to fight Hennig, Duncum, and the Windhams (Barry and Kendall). Hennig banded his group together as the Rednecks, even putting out a "top" single, Rap Is Crap. At Bash at the Beach, the four Rednecks fought in an Elimination match against Konnan, Mysterio, Swoll (one of the bodyguards) and BA Brad Armstrong. Hennig stayed until the end, when Rey Mysterio managed to pin him. The Rednecks stayed united, however, despite the loss. They next started feuding with the Revolution members, especially Hennig, who was one of the more experienced in WCW. The groups met on more than one occasion (including a confrontation between Hennig and country music star Chad Brock). The Rednecks continued down their line, with music videos and the like, while the Revolution just looked tough. At Road Wild '99, Hennig, Duncum Jr, and Barry faced Saturn, Shane Douglas, and Dean Malenko. Saturn got the win for his team, taking out Duncum with the DVD. The Rednecks began spreading apart after that, although Hennig did manage the Windhams for a time, leading them, briefly, back to the Tag-Team Titles. But Hennig soon left the cowboy life behind him. When The Powers That Be took over WCW, Curt soon found himself fighting a Retirement Match every night. He went to extraordinary lengths not to be pinned, instead punching the refs for the DQ, or being Counted Out. Hennig competed in the World Title Tournament in November, defeating Disco Inferno in the first round. He faced Jeff Jarrett in the second, and barely escaped with his career, thanks to a DQ Loss. Hennig went on to meet Buff Bagwell at Mayhem, where he was cleanly pinned. According to this, Hennig's career was ended. However, although Hennig's wrestling time had seemed to pass, he still found himself working in WCW. In a twist, Hennig began working for the Powers That Be, almost becoming their enforcer, along with Creative Control (the Harris Brothers). Due to his newfound power, Hennig began a feud with Harlem Heat. Hennig & Creative Control met Harlem Heat & Midnight at Starrcade. Hennig walked out victorious, thanks in part to problems between his opponents. Soon after, the Powers That Be left WCW, and Hennig returned to lowcard status, appearing mainly to lose matches. In April '00, Vince Russo (one of the Powers) and Eric Bischoff returned as a unit to WCW. They formed the New Blood, a force of younger wrestlers wanting their place at the top, to fight against the Millionaire's Club, which Hennig seemed to become a member due to his long experience. Hennig soon started a feud with newcomer Sean Stasiak, who was coming to the ring with Hennig's "Mr. Perfect" gimmick. The two battled it out through May, and fought at Slamboree '00. Unfortunately, "PerfectSean" came out the victor. Hennig appeared for the next few weeks, for some reason aiding Stasiak against his opponents. But the angle was soon dropped, and Hennig disappeared from the wrestling radar, eventually being released by WCW due to his constant nagging injuries. After his departure, Hennig wrestled for various independent organizations, staying in wrestling shape. He won the i-Generation Heavyweight Championship in 2000, defending it in Australia against Dennis Rodman, among others. He then moved on to Japan, competing for All Japan Pro Wrestling. Hennig would also appear with the fledging XWF, competing once again against his long-time rival, Hulk Hogan. But it wasn't until 2002 that Hennig would once again make a serious impact on the world of professional wrestling. At the WWF's 2002 Royal Rumble, multiple wrestlers made surprise appearances. But none gathered more of a reaction than the return of Mr. Perfect. Although Mr. Perfect didn't manage to eliminate anyone before being tossed by the eventual winner, Hunter Hearst Helmsley, he still made an impact at the show. Later on, however, Hennig would be destroyed by Steve Austin, killing some of his momentum. Mr. Perfect would continue competing for the WWF for the next four months, usually staying in the low-midcard matches. He still showed his technical skills, though, usually putting on a well-run match. However, after a successful show in the U.K., Hennig was involved in a brawl with Brock Lesnar on the flight home, and was released from his WWE contract in May 2002 because of the incident. Hennig stayed in the independents for much of 2002 after his release, sticking with the business that made him famous. He competed in 3PW, at one point losing to the great veteran Jerry "The King" Lawler. In October '02, Hennig joined up with NWA-TNA, immediately entering into a feud with the reigning NWA World Heavyweight Champion, Ron "The Truth" Killings. Despite multiple chances, Hennig was not able to gain the World Title, even when the belt was transfered to "Double J" Jeff Jarrett. Hennig also tried the tag-team ranks, forming up with B.G. James, but again was unsuccessful. His last match in the NWA-TNA was in January '03, when he defeated David Flair in an "Axehandle On A Pole" Match. Hennig then left the NWA-TNA, reportedly because of his displeasure with the way Vince Russo and the rest of the staff were creating storylines. Hennig returned to the independents, as reports surfaced that he was looking into forming his own wrestling company. Unfortunately, this was not meant to be. 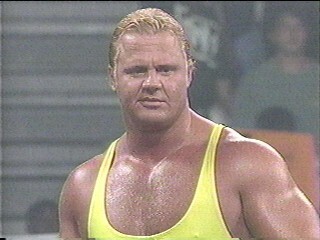 On February 10th, 2003, Curt Hennig was found dead in his hotel room by his friend, referee Mickey Jay. He was set to compete for Jimmy Hart's All Stars of Wrestling that night, continuing to perform in the business that he loved. Hennig proved, time and time again, that he was one of the greats in this business. He will always be remembered for his abilities both inside the ring and on the microphone, as he helped develop the business the way it is today. Curt Hennig was 44. - NJPW 4th Annual MSG Tag League (November 18 - December 8, '83) = Hennig and Bobby Duncan competed in the League, which was won by Hulk Hogan and Antonio Inoki. - PNCW Salem City Tournament (January '84) = Hennig won the tournament. - AWA SuperClash I ('85) = Hennig, Scott Hall and Greg Gagne were defeated by Larry Zbyzsko, Ray Stevens and Nick Bockwinkle. - AWA StarCage (April '85) = Curt & Larry Hennig lost, via DQ, to the Road Warriors. - PNCW Owen Productions 60th Anniversary Show (May '85) = Curt & Larry Hennig won, via DQ, over the Road Warriors. - AJPW Budokan Hall (December '85) = As part of the Real World Tag League '85, Hennig & Nick Bockwinkle defeated Isamu Teranishi & Masanobu Kuriso. Ted DiBiase & Stan Hansen eventually won the League. - AWA Wrestlerock (April 20, '86) = Hennig and Scott Hall retained the AWA Tag Belts by defeating the Irwins. - AWA/NWA Rage In A Cage (April 28, '86) = Hennig and Hall stayed the AWA Tag Champs by beating Konga the Barbarian and Boris Zuhkov. - AWA Battle By The Bay (June '86) = Hennig and the Midnight Rockers won over Buddy Rose, Doug Somers, and Alexis Smirnoff. - AWA Brawl In St. Paul (December '86) = Hennig lost, via DQ, to AWA World Champion Nick Bockwinkle. - AWA SuperClash II ('87) = Hennig defeated Nick Bockwinkle to win the AWA World Title. - AWA Rage In A Cage II ('88) = Hennig lost a "Steel Cage" Match to Wahoo McDaniel. - WWF Wrestlefest '88 = Hennig defeated Terry Taylor. - WWF Survivor Series '88 = Mr. Perfect, Andre the Giant, "Ravishing" Rick Rude, Harley Race and Dino Bravo fought in an "Elimination" Match against "Hacksaw" Jim Duggan, Tito Santana, Jake "The Snake" Roberts, Ken Patera and Scott Casey. Mr. Perfect and Bravo were the "survivors". - WWF Saturday Night's Main Event #19 (December '88) = Mr. Perfect defeated Koko B. Ware. - WWF Royal Rumble '89 = Mr. Perfect competed in the "Royal Rumble", which was won by Big John Studd. - WWF Wrestlemania V ('89) = Mr. Perfect defeated the Blue Blazer. - WWF Summerslam '89 = Mr. Perfect pinned the Red Rooster. - WWF Saturday Night's Main Event #24 (October '89) = Mr. Perfect defeated the Red Rooster again. - WWF Survivor Series '89 = Mr. Perfect, "Ravishing" Rick Rude and the Rougeau Brothers fought in an "Elimination" Match against "Rowdy" Roddy Piper, "Superfly" Jimmy Snuka and the Bushwhackers. Perfect was the sole "survivor". - WWF Saturday Night's Main Event #25 (January '90) = Mr. Pefect and The Genius lost to Hulk Hogan and the Ultimate Warrior. - WWF Royal Rumble '90 = Mr. Perfect competed in the "Royal Rumble", which was won by Hulk Hogan. - WWF Wrestlemania VI ('90) = Mr. Perfect was beaten by Brutus "The Barber" Beefcake. - AJPW US/Japan Wrestling Summit (April 13, '90) = Hennig and Rick Martel were defeated by Jumbo Tsuruta and Haku. - WWF Saturday Night's Main Event #26 (April 23, '90) = Mr. Perfect was defeated by Hulk Hogan. - WWF Saturday Night's Main Event #27 (July '90) = Mr. Perfect remained the WWF Intercontinental Champ by defeating Tito Santana. - WWF Summerslam '90 = Mr. Perfect lost the WWF I-C Title to the "Texas Tornado" Kerry von Erich. - WWF Main Event IV (October '90) = Mr. Perfect won, via Count-Out, over the Big Boss Man. - WWF Survivor Series '90 = Mr. Perfect and Demolition (Axe, Smash, and Crush) fought in an "Elimination" Match against the Ultimate Warrior, "the Texas Tornado" Kerry von Erich and the Legion of Doom. Perfect was eliminated by the Warrior, who was the sole "survivor". - WWF Royal Rumble '91 = Mr. Perfect competed in the "Royal Rumble", which was won by Hulk Hogan. - WWF Wrestlemania VII ('91) = Mr. Perfect lost, via DQ, to the Big Boss Man, but retained the WWF I-C Title. - SWS Wrestlefest (March '91) = Mr. Perfect lost, via DQ, to "the Texas Tornado" Kerry von Erich, but again retained the WWF I-C Title. - WWF Saturday Night's Main Event #29 (April '91) = Mr. Perfect won a "Battle Royale". - WWF Summerslam '91 = Mr. Perfect lost the WWF I-C belt to Bret Hart. - WWF Survivor Series '92 = Mr. Perfect and "Macho Man" Randy Savage win, via DQ, over Ric Flair and Razor Ramon. - WWF Royal Rumble '93 = Mr. Perfect competed in the "Royal Rumble", which was won by Yokozuna. - WWF Wrestlemania IX ('93) = Mr. Perfect was defeated by Lex Luger. - WWF King of the Ring '93 = Mr. Perfect won, via DQ, over Mr. Hughes, then lost to Bret Hart. - WWF Summerslam '93 = Mr. Perfect lost, via count-out, to the WWF I-C Champ, Shawn Michaels. - WWF King of the Ring '96 = Mr. Perfect was the special referee in the WWF World Champ Shawn Michaels-Davey Boy Smith match, which Michaels won. - WCW Bash At The Beach '97 = Hennig and Diamond Dallas Page lost to Scott Hall and "Macho Man" Randy Savage. - WCW Road Wild '97 = Hennig defeated Diamond Dallas Page. - WCW Clash of the Champions XXXV (August '97) = Hennig and Ric Flair defeated Konnan and Syxx. - WCW Fall Brawl '97 = Hennig, with Ric Flair, Chris Benoit, and Steve "Mongo" McMichael, lost to Kevin Nash, Konnan, "Buff" Bagwell, and Syxx (thanks to Hennig's betrayal). - WCW Halloween Havoc '97 = Hennig won, via DQ, over Ric Flair, to retain his WCW US Title. - WCW World War III '97 = Hennig again defended the WCW US Title by defeating Ric Flair. Later in the night, Hennig competed in the "3 Ring Battle Royal", which was won by Scott Hall. - WCW Starrcade '97 = Hennig lost the WCW US Title to Diamond Dallas Page. - NJPW Budokan Hall (February '98) = Hennig defeated Satoshi Kojima. - WCW Uncensored '98 = Hennig was forced to submit to Bret "Hitman" Hart. - WCW Spring Stampede '98 = Hennig managed to pin the British Bulldog. - WCW Bash At The Beach '98 = Hennig was defeated by then-World Champion Bill Goldberg. - WCW Road Wild '98 = Hennig was involved in a Battle Royal with Bill Goldberg, Kevin Nash, Sting, Lex Luger, Konnan, Scott Hall, Scott Norton, and The Giant. Goldberg was the winner. - WCW Fall Brawl '98 = Hennig lost, via DQ, to Dean Malenko. - WCW Souled Out '99 = Hennig and Barry Windham were defeated by Ric and David Flair. - WCW Superbrawl IX ('99) = Hennig and Barry Windham, in the Finals of the Tag-Team Title Double Elimination Tournament, lost their first fall to Benoit & Malenko, but won the second fall with Windham's strike with the belt, becoming the tag-team champions. - WCW Uncensored '99 = In a Lumberjack title match, Hennig and Barry Windham were defeated by Benoit & Malenko after Arn Anderson's interference. Benoit & Malenko became the tag-team champions. - WCW Great American Bash '99 = Hennig and Bobby Duncum Jr lost to Rey Mysterio Jr and Konnan, after interference from one of Master P's bodyguards. - WCW Bash At The Beach '99 = Hennig, Bobby Duncum Jr, Barry and Kendall Windham faced Konnan, Rey Mysterio Jr, Swoll, and BA Brad Armstrong. Mysterio was the only survivor, pinning Hennig. - WCW Road Wild '99 = Hennig, Bobby Duncum Jr, and Barry Windham were defeated by Dean Malenko, Shane Douglas, and Perry Saturn. - WCW Mayhem (November '99) = Hennig lost a "Retirement" Match to Buff Bagwell. - WCW Starrcade '99 = Hennig & Creative Control defeated Harlem Heat & Midnight. - WCW Slamboree '00 = Hennig was beaten by "Perfectsean" Stasiak. - i-Generation Superstars of Wrestling (July '00) = Hennig defended the i-Generation Championship, fighting to a DDQ with Dennis Rodman. - AJPW Tokyo Dome Show (January '01) = Hennig, Barry Windham, & Mike Rotunda were defeated by Jim Steele, Johnny Smith, and George Hines. - WWF Royal Rumble '02 = Mr. Perfect competed in the Royal Rumble, which was won by Hunter Hearst Helmsley. - WWF Wrestlemania X-8 ('02) = In a dark match, Mr. Perfect, Lance Storm & Test lost to Scotty Too Hotty, Rikishi & Albert. - WWF Insurrextion '02 (May 4) = In a dark match, Mr. Perfect defeated Goldust. - NWA-TNA PPV (Show #15, October 9, '02) = Hennig, BG James & Syxx-Pac won over Ron Killings, Jeff Jarrett & Brian Lawler. - NWA-TNA PPV (Show #16, October 16, '02) = Hennig lost to the NWA Champ, Ron Killings. - 3PW A Night For The Flyboy (October 19, '02) = Hennig was beaten by Jerry Lawler. - NWA-TNA PPV (Show #17, October 23, '02) = Hennig again fell to the NWA Champ, Ron Killings. - NWA-TNA PPV (Show #18, October 30, '02) = Hennig lost in the 1st round of the NWA World Title Contenders Tournament to Jeff Jarrett. - NWA-TNA PPV (Show #19, November 6, '02) = Hennig lost in the semi-finals of the NWA World Title Contenders Tournament, losing, via DQ, to Jeff Jarrett. - NWA-TNA PPV (Show #22, November 27, '02) = Hennig & BG James lost, via DQ, to the NWA Tag Champs, the New Church. - NWA-TNA PPV (Show #24, December 11, '02) = Hennig was beaten by the NWA Champion, Jeff Jarrett. - NWA-TNA PPV (Show #26, January 8, '03) = Hennig won an "Axehandle On A Pole" Match over David Flair.